If you're even thinking of being in Denver, check out the rest of our DestiNATION Denver travel guide. It's stacked with expert advice from locals on what to eat, where to drink, and what to do in the Mile High. You're flying into Denver. As the plane descends, your mind begins to wander. You're thinking about what breweries to go to and where you'll have dinner tonight. What neighborhoods to check out and what bars to hit. And that's when you see them out of the window: the Rocky Mountains. Home to some of the best skiing and snowboarding in the world, the Rockies are impossibly easy to get to from Denver... and you need to go. 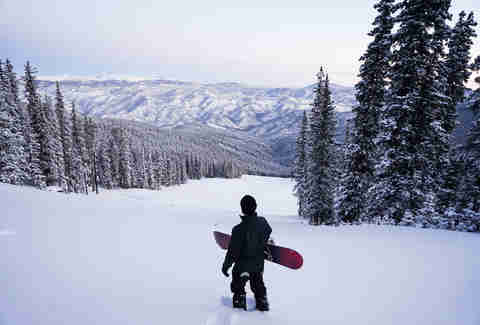 In fact, Colorado is home to almost 30 ski areas, many easily reached by a two hour car ride from Denver. Most of these trips are accomplished in a day, so you can hit the lifts in the morning and be back in town early enough for a cold beer and a game of pool at Dive Inn. Or, if the mountain’s just too good to leave, we’ve got you covered on the best places to eat, drink, and dream of fresh powder. Denver locals consistently name Copper as their favorite Colorado mountain, and it’s easy to see why. With nearly 3,000 feet of vertical and 140 runs -- take your pick from steep, powder-filled chutes, bowls, fast cruisers, or flat groomers -- you can’t even come close to tackling all the terrain in two days. The slopes are conveniently divided by nature -- the steeper terrain stemming out of the East Village, intermediate slopes out of the Center Village, and beginner slopes out of the West Village. Copper has a more of a relaxed feel than nearby resorts like Vail or Breckenridge, thanks in part to free, shuttle-serviced parking. Plus, there are other options for reveling in gravity’s downward direction: tubing, an alpine coaster, and Woodward, the one-of-a-kind ramp, trampoline, and foam pit-equipped facility where pro skiers and snowboarders workshop their newest tricks. On top of that, there's a spa, athletic club, ice skating, cross-country and snowshoeing, and an ongoing lineup of festivals and competitions. Where to eat and sleep: Condo-style lodging can be found in each Village, accessible by free resort shuttle. Copper is self-contained with a grocery store, numerous equipment and outerwear shops, and a wide range of restaurants, from coffee and donuts and fresh sushi and ramen at Storm King Lounge, to habit-forming baby back ribs at family-owned Double Diamond. The après scene is always festive, with live music from long-time party starters Lefty Lucy at Jack’s, and Moe Dixon at JJ’s. Loveland doesn’t always get the love it deserves, despite being the biggest and best value ski area near Denver (and receiving more snowfall than swankier nearby resorts). 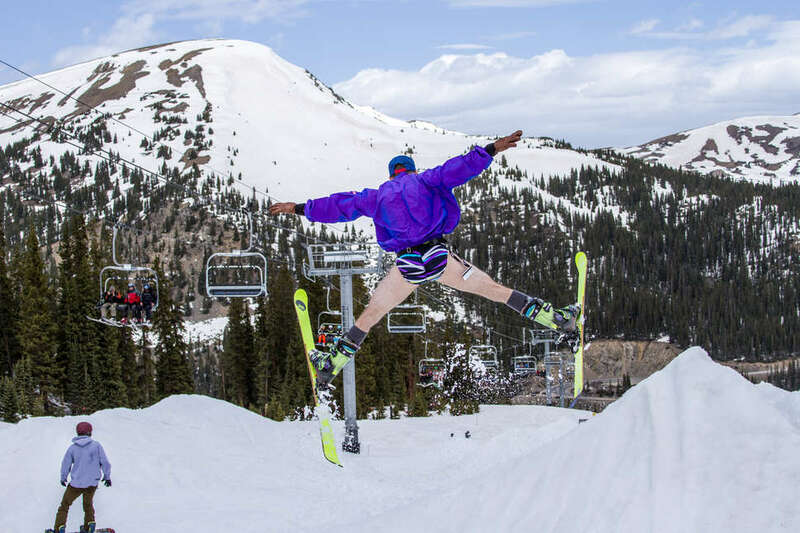 Situated on the slopes of the Continental Divide, Loveland’s terrain ranks among the highest anywhere -- the base sits at 10,800 feet, with hiking access (and free snowcat rides) to the ridgeline above 13,000 feet. Of the area’s 94 trails, most measure on the steep side, but beginners can rejoice in an entirely separate area (Loveland Valley) designed expressly for learning. The ski school offers private and group lessons for all skill levels, gear rentals range from state-of-the-art demos to jackets, pants, goggles, and gloves. Where to eat and sleep: Your on-mountain dining options are somewhat lackluster, but more affordable than nearby resorts. You won’t find a more authentic local après vibe than the bar at Rathskeller. Oh, there’s free parking, too. The downside is that Loveland is simply a ski area, meaning there are no hotels on-site. The best overnight option lies 10 minutes farther along I-70, in the bustling town of Silverthorne. Dinner spots include the always-packed Sauce on the Blue for thin-crust pizza, Cultivate Kitchen for scratch-made bites (think beet sliders or prosciutto and Swiss cheese-slathered Focaccia bread), and the adjoining Angry James Brewery. The Bakers' Brewery also specializes in creative beers, as well as more substantial dinners (fish & chips, GF lasagna made from cauliflower, etc.). There’s also the historic allure of the 156-year-old Mint Steakhouse, where you flame-broil your own meat. Happily, lodging in Silverthorne is considerably more affordable than at nearby resorts. There are many distinguishing features of A-Basin -- or The Basin, as locals call it -- but the one you’ll notice immediately is The Beach. This Beach is the parking lot situated directly in front of the base chairlifts where locals and regular visitors barbecue, celebrate birthdays, and even camp overnight. To wander through it feels akin to attending a college football game, only with fewer keg stands and everyone is wearing ski boots. Starting at nearly 11,000 feet, The Basin’s summit peters out above 13,050 feet, making it one of the highest ski areas in the world. The majority of its runs rank on the gnarly side -- most difficult to expert. The Basin also has a longer season than just about anywhere, rivaled only by the world’s glaciers. It opens mid-October and has been known to stay open until July 4. The place hosts numerous competitions for bionic mountain athletes (involving skinning up the top windy ridges and then skiing down among the cliffs, hunting for beacons, etc.). Where to eat and sleep: The Basin’s dining options straddle the line between gourmet and comfort fare, ranging from bone marrow baguettes to the best damn waffle fries you’ll ever eat, plus a long list of Colorado beer. There's also a superb ski school and gear shop at the base, but no hotels or nightlife (beyond 8pm), so your best bet for those are either in neighboring Keystone or Silverthorne (see below). Fun travel planning: tracking down exactly where to get the best local eats. Not-so-fun travel planning: tracking down the cheapest flight. Thankfully, Expedia has everything you need to go. That includes flights, accommodations, activities and more -- making it even easier for you to turn those travel goals into solid plans. This sprawling trio of peaks offers both 3,000-plus acres of terrain and vertical. 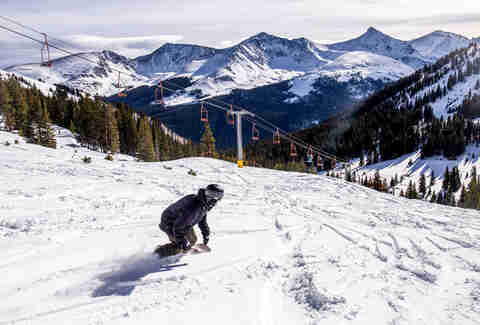 Although Keystone is popular among families (for its village parades, snow fort, tubing, ice skating, and kids-ski-free packages), people are often surprised by its bounty of expert trails. About 50% of the terrain is rated “most difficult” and even the pitch on the intermediate runs might get your knees knocking. Where to eat and sleep: Post-powder, you'll want to hit the divey après spot the Goat, boasting a steady flow of PBR and late-night live music. Lodging options, though plentiful, err on the pricier side, and there’s a spacious and fully pampering spa. What really sets Keystone apart is the fine dining. Housed in a charming wooden B&B that served as a stage coach stop in the 1800s, Ski Tip Lodge is consistently rated the best restaurant in Summit County, specializing in seasonally fresh, four-course options. 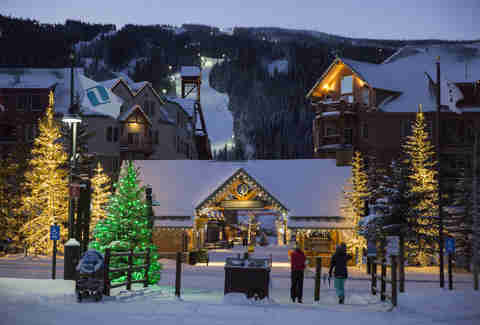 There is a trio of similar rustic-chic options, two of which are located on North Peak, requiring two gondola rides to reach (a great opportunity to check out Keystone’s night skiing from above). The Alpenglow Stube has collected countless food and wine awards and serves up things like charcuterie plates, smoked salmon, and irresistible bacon flights. Also on the mountaintop, Der Fondue Chessel brings in the family crowd, but let’s be honest, who doesn’t love a vat of hot cheese? Eldora is no bunny hill. It's home to a shiny new high-speed, six-person chairlift and around 50 ski trails ranging from steep, packed glades, bumpy blacks, and a separate, too-big-for-a-bunny-hill area called Little Hawk -- fitted with shorter beginner and intermediate runs. Despite the modern rental shop and stocked boutiques, every day here feels like retro ski day -- a handful of regulars sport zany one-pieces and rooster-emblem Rossignols from the '80s. Where to eat and sleep: The best après option is Timbers Tap House with its long list of craft brews, but the scene winds down around 6pm. The quirky and artistic town of Nederland, less than a 10-minute drive away (you might have to park there and take the bus to Eldora on a busy weekend) is the area’s best base camp. Coffee is roasted on the premises at New Moon Bakery, and homemade beers and slow-cooked wings will hit the spot at James Peak Brewery & Smokehouse. For wood-fired pies and hard-to-find (mostly local) craft beers, hit Crosscut Pizzeria. If you're after live music, tacos, and burgers, the classic dive Pioneer Inn is the spot. And small town nightlife hits high volume at The Caribou Room. Need a room? Rustic, in-town accommodations can be found at Boulder Creek Lodge and a historic, jarringly authentic taste of the Old West at the Goldminer Hotel, located on its lonely dirt road. Winter Park’s 166 trails (and unchartered backcountry terrain) are divided into distinct areas. The namesake segment is evenly divided by skill level, and the others largely serve specific niches -- Discovery Park for beginners, Parsenn Bowl for wide open cruisers and steep seekers, Mary Jane for mogul enthusiasts, and Eagle Wind for cliff jumpers and glade cravers. There is an unquestionable giddiness that falls over you once you get out of the bumper-to-bumper traffic on I-70, but another of Winter Park’s winning features is that on the weekends, you can take a train directly to the base area from Denver’s Union Station. Once you’re there, it’s pretty well self-contained with a walkable village and free local shuttle. 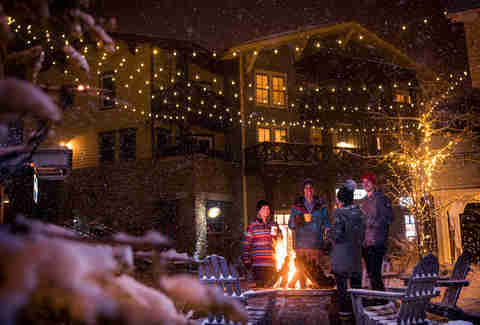 Where to eat and sleep: Winter Park’s lodging, like its slopes, offers a wide range of affordable options like the Sundowner motor lodge, surprisingly affordable options like Meadow Ridge condos 5 miles down to road in Fraser, and some (relative to some resorts) affordable ski-in, ski-out condos like the Iron Horse Resort. Aprés opportunities are also across the board, quite literally with the pop-up Alpine & Ales, an outdoor bar that moves around the slopes; the master chef-inspired (elk tenderloin, anyone?) Vertical Bistro; or tequila and grilled tacos at Lime. To be honest, Echo Mountain is not a fair representation of what Colorado has to offer. But for the first timer (there is no ski school, but on-mountain staffers provide free guidance) or the occasional skier whose token experiences have involved raking over East Coast ice in subzero temperatures, this could be the greatest ski day of your life. 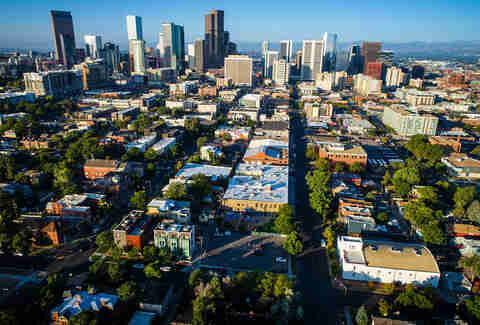 It’s also the Centennial State’s most affordable option and the one closest to Denver. The road there, albeit short, is legit mountain driving. Don’t speed around the 12 miles of hairpin turns -- especially during a snowstorm -- that take you to the base area above 10,000 feet. Originally opened in 1960 and sitting vacant for a number of years, the area served as a private race training venue and then a terrain park. Echo Mountain has had its current incarnation -- one triple chairlift serving 600 vertical feet of blue and green runs, plus a section of black-rated glades -- since 2016. There is no terrain park, but a flat learning area, a tubing hill, night skiing, and a friendly pub with decent burgers and a solid beer lineup. Where to eat and sleep: The best après or overnight option is 30 minutes down the road in the high elevation residential hamlet of Evergreen. Here you’ll find a ton of shops, bars, restaurants (Evergreen Bread Lounge is excellent for breakfast or lunch) and even a few breweries, including El Rancho, which has an outstanding weekday happy hour and is conveniently located right off of I-70, next to a Comfort Suites. A Denver native, freelance writer Shauna Farnell loves a throwback ski lodge but has never donned one-piece outerwear. Follow her on Twitter @shaunafarnell or on Instagram @mountaingirlinthecity.